A person who played a very important role in the life of my family when we lived at the Manse back when I was a kid was Art Gough – a gifted and much-loved teacher and principal, a marathon-runner, and a man with a boundless sense of how much fun life could be. Anyway: I am sad to report that Art died a week ago tonight. Today his family and many of his friends gathered for a celebration of his life. In the days between I have, as you might imagine, been thinking a lot about Art, a truly remarkable man whose approach to life had a large impact on my own. I was extremely honoured (and more than a little bit nervous) that Art’s sons asked me to speak at the service today, and I’ll put the text, more or less as I said it, at the end of this post. My focus was primarily on Art as our Queensborough neighbour and good friend of my father, The Rev. Wendell Sedgwick. That is how I knew him best. But I was a bit worried about not going into all the other important things that Art was – teacher and principal, as already noted; and exceptional athlete, also as noted; but also world traveller, participant in theatrical productions, Christian Science member, animal-lover, and on and on the list goes. I needn’t have worried, though. Wanda Burnside, a former Madoc Township Public School teacher, painted a wonderful picture for us of the exciting and memorable times the school went through under Art’s leadership; and Bill Gough, Art’s youngest son, spoke eloquently and movingly about many parts of Art’s life – including, of course, Art as father and grandfather. The pride and affection in Bill’s voice as he spoke were lovely to hear. As was the fact that a major focus of his talk was how much Art liked to laugh, and how good he was at getting others to laugh. That is one of the things I will remember most about Art. He had an incredibly quick mind, and he used it in the best possible way: to enjoy life, and to help others do the same. 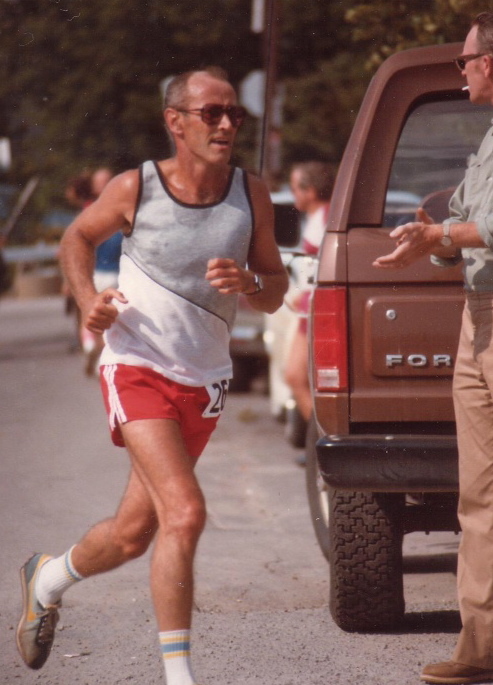 And speaking of the running, I well remember how, when Art and his family moved to Queensborough in 1970, running was seen by the people of Queensborough as an extremely peculiar thing to do. (I think this was a bit before Participaction had kicked in.) That said, it wasn’t long before they got used to seeing him out on the road, and began not to be so surprised by it. However: I can tell you from first-hand experience that there was some pretty major head-shaking and eye-rolling down at the general stores when Art was spotted running on icy roads that were well-nigh impassable to vehicles during the worst winter days. But that was Art. Indomitable, unstoppable – and full of life and laughter. Now that I think of it, the image of him out running on the icy winter roads around Queensborough is – well, it’s classic Art. It was something nobody else would have done – and there was Art, doing it. It was a perfect example – though there are many examples – of how he stood out from everyone else. The father, grandfather and friend whose life we celebrated today was an extraordinary person. I hope all who knew him who might be reading this will stop and think about something he did or said that made them laugh. I think Art would like that a lot. Since Art Gough was an educator, you probably won’t be surprised when I tell you that he taught me something – well, me and a whole lot of other people. Probably many of you here. Given the number of students he interacted with through his career, probably hundreds and hundreds of people. As I’ve been thinking about it over the past several days, though, I’ve had trouble finding just the right word or words to describe what that very important lesson was. Then this morning I happened to be on a long, quiet drive, and about halfway though, the words “vibrant spirit” came to me. “Man!” I thought. “That is the perfect way to describe Art.” And maybe that is also the best way to describe what he taught us through his example: to have and to be a vibrant spirit. My family and Art’s became friends when the Goughs moved to our little hamlet, Queensborough, in 1970. My father Wendell, the United Church minister, was always quick to welcome strangers, and so he invited Art and Claude for dinner to the Manse one Sunday evening. (The rest of the family hadn’t yet arrived from their previous home in the Newmarket area.) This turned out to be the first of what would be many get-togethers over the years; Claude, Graham and Bill were not much different in age from my three siblings and myself, and our parents hit it off immediately. In particular, the friendship between Art and Wendell was something that I think I am safe in saying had a deep and lasting impact on their lives – and on ours. The Goughs and the Sedgwicks spent wonderful times pre-screening films that Art had ordered for use in his schools (with long discussions and dissections of them afterward); and around the dinner table, with great big pots of tea to finish off the meal; and on long hikes through the woods and wilderness around Queensborough. And always during these happy times there was a great deal of talk – mostly between Art and Wendell, though we were all welcomed and encouraged to join in. There was talk about religion, about science, about education, about history, about running. About the mysteries of the universe. It was good talk, often scholarly talk. Friendly but pointed debate. There were challenges and responses. Agreement, sometimes. Agreement to disagree, other times. I think I speak for Art’s sons, and I know I speak for my sister and brothers, when I say that we loved listening to Art and Wendell talk. Art knew the secret to good and lively conversation. It’s a very simple tactic, but oddly, many people don’t seem to be aware of it. It is just this: ask people questions. And if you want it to be a really lively conversation, ask them questions about themselves. Actually, there’s one other thing you have to do to make this tactic work: be genuinely interested in the answers you get. That was something Art was a master of. He would ask you something about yourself: your work, or where you came from, or what you thought about such-and-such a thing, or maybe (if you were a young person) what you hoped to do with your life. He would listen carefully to the answer; and he would use it to formulate a followup question. And another. And another. And so he would end up finding out an enormous amount about you as a person. But perhaps more importantly, he often helped you learn something about yourself. Because his questions were not the kind that you gave yes-and-no answers to. Without being the least bit invasive, they were – searching. Which meant that the answers they elicited were often illuminating. I have heard people say, during a night of conversation with Art, “I’ve never told that story before” or “I’ve never thought of it like that before.” And they would say it with kind of a sense of wonderment. He had drawn something special out from somewhere deep inside them. That, my friends, is a gift. And while I never had Art as a teacher or principal, I can easily imagine what a gift it was to his students to have this adult in a position of authority pay so much attention to them, to be so interested in who they were and what they could do and what they hoped to do. Art knew that everybody has stories to tell. And that sometimes they don’t even know what those stories are until they start telling them – because somebody thoughtful, kind and wise has encouraged them to. That was Art. His brilliance at conversation was something to watch. 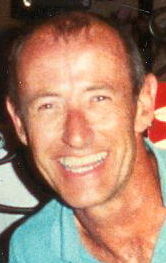 Until I got used to it by spending enough time in his company, I used to be amazed at how, under his seemingly effortless direction, a theme would emerge from an afternoon or evening of conversation, and how he could tie together the various threads that the talk had taken, bringing us back to that theme – generally with great joviality and much laughter. Laughter was a very important ingredient in the mix when you spent time with Art. As I’ve been thinking about him over these past days, it has struck me that I absolutely cannot picture him without a huge smile on his face. He would grin when he first saw you, exclaim, “Great to see you!” – and you could tell he absolutely meant it. He loved stories (his own and others’) that made him – and you – laugh. He was a keen observer of quirks and eccentricities – including those of daily life in Queensborough – and when he talked about them they seemed even funnier. Well! Art seemed to think that that was at once the most incredible and the funniest thing he had ever heard. “Really? No, that can’t be true.” And so on. He wasn’t going to let the subject drop, because it was just too much fun. After much banter, he finally decided that he would need to verify this amazing phenomenon for himself. He demanded the evidence! And so we kids happily obliged by rooting through the fridge and bringing out the olives, jar after jar after jar. Since you all knew Art you can probably well imagine his expressions of ever-increasing astonishment and hilarity as we got into the double digits. Everyone around the table was laughing their heads off – including my mother. It was a wonderful, convivial, uproarious evening, one none of us ever forgot – and it was Art who made it happen, who directed the play, so to speak. And who was having at least as much fun as everybody else. And who made us laugh for years afterward when he would drop a reference to “the Olive Incident” into other conversations. The thing about Art was that with him you never knew how a day, or an evening, or a conversation, would end up. The only thing you could be sure of was that it would take many interesting directions, very possibly some detours – and that you would enjoy being along for the ride. To be genuinely, genuinely interested in other people. To appreciate and celebrate the world around us, and the possibilities of life, including and perhaps most especially the simple ones close at hand. To laugh, readily and often and unreservedly. And most importantly – to share those gifts with others. Art – thank you for all of that. May the lesson of your vibrant spirit live on in all of us. I think he’s right. Don’t you? When this is the scene you’re facing as you leave home on your early-morning drive to work (as it was for me this past Wednesday), you want to know the safest route. Fortunately, our neighbours in Queensborough are totally on top of that. Actually the name of this post should be “The road not plowed,” but that wouldn’t have quite the same cadence as the name of Robert Frost‘s famous and lovely poem The Road Not Taken. The title of which would also, now that I come to think of it, also be appropriate for this post. Which is about winter and snowfall and living in a very rural area. And the helpfulness of neighbours. So: as I’ve mentioned before, the hamlet of Queensborough is part of the rather sprawly municipality of Tweed. But it’s also right on the border with another municipality, the township of Madoc. And Queensborough Road, which is our main street, has sections in both municipalities. The section that runs through Madoc Township to Cooper Road (which takes one to Highway 7 and the village of Madoc) is the most direct route south to Belleville, where I go to work each morning – so obviously that is the route I normally take. Which our neighbours have astutely observed. And that’s why not one but two of them went out of their way to warn me the other day, just in advance of the first snowstorm of this winter, that when there’s been snow I should take Queensborough Road in the other direction (which also dumps one out at Highway 7). Because that section, the one that’s in the municipality of Tweed, gets plowed early in the morning. And the Madoc Township section one doesn’t – and so isn’t as safe. Have I mentioned before – actually, I know I have, many times – how much I appreciate our neighbours? As you can tell from the new photo atop the blog – taken at about 7 a.m. this morning – winter seems to arrived in earnest here in the snow belt. 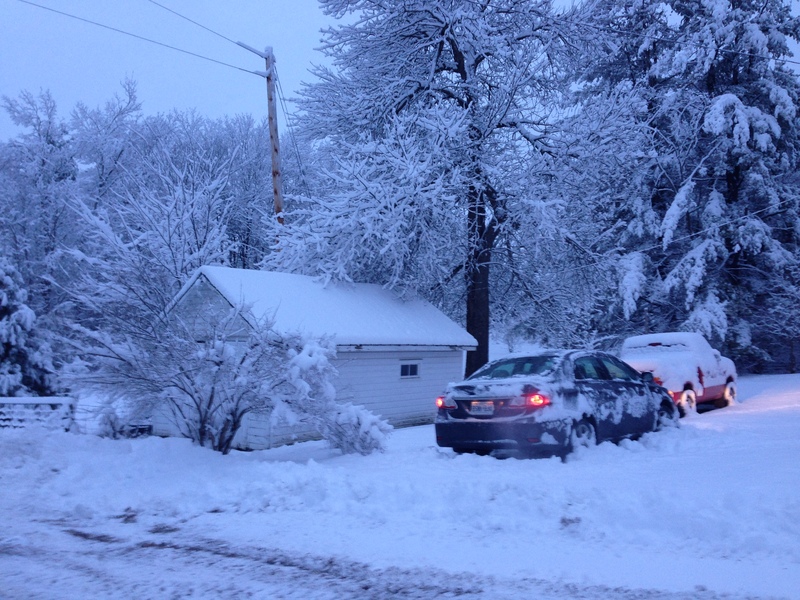 While all that overnight snow last night made things quite beautiful here in Queensborough this morning, it also meant that digging-out-the-car time has arrived again. More on that anon, save to say that we Manse-dwellers are blessed with neighbours who kindly have steered us toward the safest (that is, earliest-plowed) routes on snowy mornings, not to mention a neighbour with a plow who has agreed to be our clear-the-driveway guy on snowy mornings like this. Anyway, let’s leave off the hard work of snow-clearing and get back to the winter-wonderland aspect of winter. The snowy beauty may wear a bit thin by, say, mid-February, but in late November and December, in the days leading up to Christmas, it’s all very nice to think about. 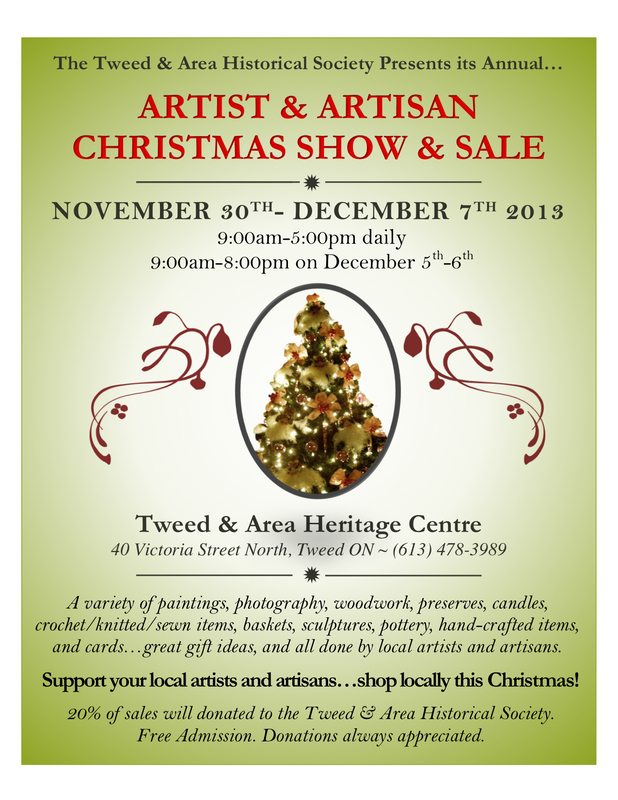 And hey, what would Christmas be – especially in small towns and rural areas – without local bazaars? Of which, as you can probably imagine, there are a lot around here. At churches and schools and community centres. Weekends, weekdays, whatever – there’s a bazaar and craft fair and holiday sale for every taste. But tonight I’m drawing to your attention – thanks to my correspondent Pauline, a fellow resident of Elzevir Township, a wonderful photographer and gardener, and a wholehearted supporter of community projects and the local arts scene – one in particular, which starts this Saturday and runs through the following Saturday, Dec. 7. So, people, I think you’d better check it out, as I will be. Christmas shopping made easy, and you’ll be supporting local heritage research and education into the bargain. What could be better? Great midcentury music – keep those nominations coming! Thanks to all of you who’ve responded to The Great Manse Era Music Challenge! The first nominee to come in for a song from the time of my growing-up years at the Manse in Queensborough (1964 to 1975) that can’t help but put a smile on your face is The Lovin’ Spoonful‘s wonderful Summer in the City – which, as my friend Lindi noted in suggesting it, is perfect for a night when apparently the first snowstorm of the season is upon us. You can watch it atop this post, complete with some pretty awesome lip-synching by John Sebastian. Next is another great one, this one suggested by Maureen: Build Me Up Buttercup, by The Foundations. I love that song! But I wondered at first if it was from the right era, because to me it’s got kind of a 1950s vibe about it. But I checked, and Maureen’s spot-on; it was released in 1968. Perfect! My Manse years are now your musical challenge! I suppose you might be wondering what Elvis Presley singing Suspicious Minds is doing atop today’s post. People, I have decided that it’s time for me to get you to share a bit about yourselves. Don’t worry, nothing too too personal! Here’s what I want: tell me your favourite song from my growing-up-at-the-Manse years. That would be between July 1964 (when my dad and mum pulled into the driveway in their 1956 Chev with four-year-old me, two-year-old Melanie, and infant John in tow, to begin their life in Queensborough) and July 1975, when 15-year-old me wandered forlornly through the newly empty rooms of the Manse for what I thought (erroneously, as it turned out; decades later, I of course found out that you can go home again) was the last time, as our family moved to Campbellford, Ont., and my dad the United Church of Canada minister was about to take up a new pastoral charge. I got thinking about this musical topic as I was chopping vegetables for a stir-fry for dinner this evening. It had been a long day, I was tired, and I needed something to pep me up, so I hit play on the old iTunes playlist. Man, there was some good music to chop leeks and carrots by! But the best – as it always is – was when Suspicious Minds came on. People, I am not much of an Elvis fan, but I love that song. How can one not? It just instantly takes you back to 1969, and what on earth could be wrong with that? I am not saying that Suspicious Minds is my all-time favourite song from the 1964-to-1975 Manse era; but it is right up there. It invariably makes me stop whatever I’m doing and dance. I just can’t help myself. Okay, so it’s your turn: what song from that era makes you have to stop what you’re doing and dance? Or just takes you back to a time and place when you were supremely happy? Or is just simply such a great song that you can’t help but smile every time you hear it? Send in your picks via the comments, and I will do my best to rustle up entertaining YouTube videos of them to share from time to time. So that as winter 2013/14 sets in – as it seems to be doing in earnest tonight – we can all sit back and hum a few bars. Or get up and dance. Oh, and P.S. : You don’t have to pick only one song. Given that 1964 to 1975 was probably the best era there will ever be for popular music, there’s an awful lot of good stuff to pick from. Send a few nominations! Here’s one of my own runner-up choices, a classic. Enjoy! Where have you gone, Popsicle Pete? My friend Lynn dredged up this Popsicle Pete comic – which by the looks of it is the very first one, since it’s “Introducing” our hero – on the proverbial internet. 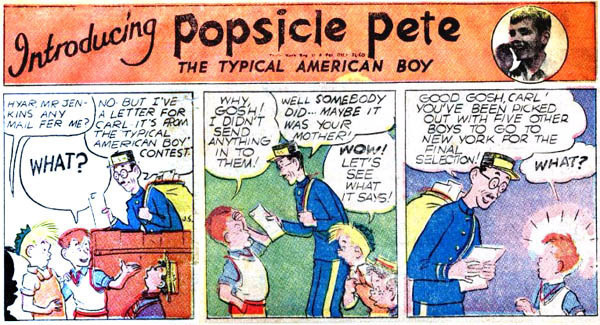 Was Popsicle Pete still “The Typical American Boy” by the time my childhood rolled around? I’m not sure how well that would have gone over here in Canada. In an email exchange last week, our Nova Scotia friend Lynn managed to remind me of a long-forgotten and arcane piece of our childhoods, and perhaps yours too: Popsicle Pete. 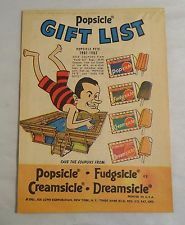 Do you remember Popsicle Pete? I have to say my recollections are a little fuzzy on that front, but as I recall he was a comic-strip character used to urge us to buy more Popsicles. Was the general idea to collect lots of Popsicle wrappers and send them in for great prizes and gifts? I think maybe. Did anyone ever do that? Not me, that’s for sure. Your Popsicle Pete information would be most welcome. But meantime, I have to say that this train of thought has brought back delightful memories of the simple joy of walking down to Bobbie’s or McMurray’s general stores in Queensborough on a hot summer day and buying (for 5¢, wasn’t it?) a Popsicle. Orange or grape – or if you were really lucky, they’d have some chocolate Popsicles; those were the best. And if you were incredibly unlucky, all that would be left would be the banana-flavoured ones. Yuck!